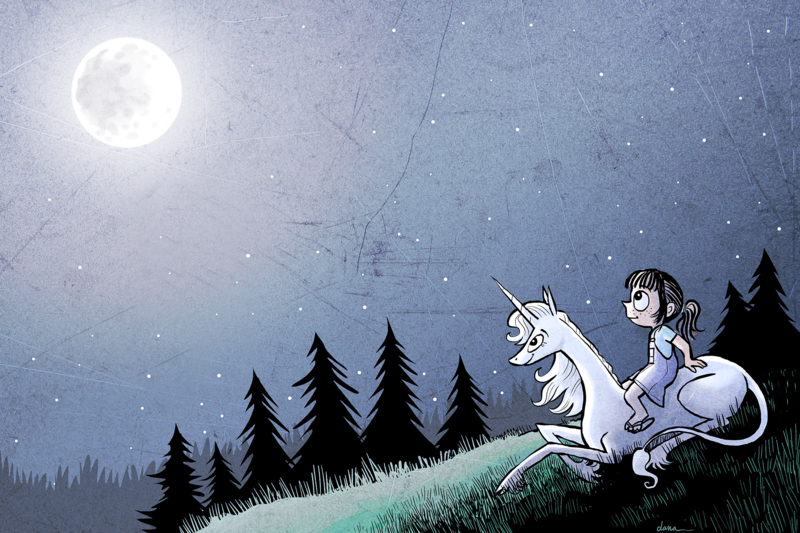 “Phoebe and Her Unicorn” is my current comic strip. It’s syndicated in a couple hundred papers internationally. In 2009, I won the Comic Strip Superstar contest. This entitled me to several contracts with Universal Uclick, formerly Universal Press Syndicate, which is what I still say when people ask because it sounds better. My winning strip, originally called “Girl,” morphed into a strip originally called “Heavenly Nostrils,” which ran online for three years before finally being launched in print on March 30, 2015, as “Phoebe and Her Unicorn.” It’s the story of a little girl, Phoebe, who manipulates a unicorn into becoming her friend. It’s also been released in book form, to some acclaim. Phoebe and Her Unicorn was released in September 2014, and the followup, Unicorn on a Roll, comes out May 26, 2015. Where it kind of all started. I drew the online strip “Ozy and Millie,” the story of two eccentric fox children, for a decade and change, starting when I was in college; it ran as a mostly-daily strip online between 1998 and 2008. I often say that “Ozy and Millie” was my Ph.D. in cartooning. I really didn’t know what I was doing, at first, although I was doing something well because people seem to like those crude first strips. Over time the whole thing developed into something weird and wonderful. I have no plans to bring “Ozy and Millie” back as a strip, but watch for the characters to reemerge in some comic-book-style stories one of these days. The strip can be read online at ozyandmillie.org; it can be bought in book form on Lulu. “I Drew This,” or IDT if you prefer, was a political cartoon I drew from 2004 to 2009. It started out in the Washington State University Daily Evergreen, and quickly took on an online life of its own. It helped me, and I’m told a fair few other people, cope with the wall to wall awfulness and stupidness that was the Bush era. I retired it when Bush left, because frankly I was burned out on the subject, and by that time the liberal blogosphere had gone mainstream and it seemed like, at last, the things I wanted said were being said. I just wanted to do other things besides be angry every day. If you wanna reminisce, it’s all archived here. A graphic novel I ambitiously intended to post online as I was writing it; I imagined it as a deconstruction of the strange cultural status of talking animals in cartoon universes, which seemed interesting at the time. I didn’t really know how to write a graphic novel, and I was floundering a bit with the project when I landed my current gig; I more or less abandoned Raine Dog at the time. Sweet. More O and M.
Oh, my goodness. We talked about Heavenly Nostrils at FC, but I don’t think you had any more than rough sketches of the H4eavenly One Herself. She’s GORGEOUS, Dana! Lovely and graceful and dignified, and you shift your style just enough when you draw her to give her an air of Otherness that every unicorn should have and few muster. Alas, idrewthis.org now points to what seems to be a Japanese (I think) placeholder page. I don’t read Japanese or whatever this is, so I have no clue what it’s saying, but it doesn’t look much like the strip. Did you maybe forget to renew your domain name? Yeah, that’s pretty much exactly what happened! I’m enjoying Heavenly Nostrils so far. And I loved Ozy and Millie when it was going. any chances Ozy and millie will make a come back some day? What happened to Raine Dog? Does anyone have the old version or some part of it? Please, I love this comic, but never found material related to it. Help please! I would like to see more Ozy and Millie. I loved the comic and I love them so much. Do you think someday, if no one starts writing them themselves, could you start them again, this time showing them in middle school? I don’t want to say TOO much, but I have some future plans for them. I don’t suppose you could tell us when we could expect future plans? Frankly I found Ozy & Millie about a month ago, and I’m addicted, so if you could tell me when I can expect some new stuff, that would be awesome. They do have a book out now! While I am interested in seeing Ozy and Millie again in some context, I kinda want them to stay a the ending they have if only because it lets my own imagination run wild. I don’t play to write fanficiton but I like to imagine the future scenarios and hijinx those characters will get up to in the future while I re-read the comic strip over and over. The one thing I want to see happen is that cow principal to get punched in the face, but that’s just me.